The Mushroom Diet, or the M-plan, is another in a long list of fad diets with false promises and celebrity endorsements. The science of metabolism does not back up this diet's promise of miraculous weight loss, particularly in selective body parts. 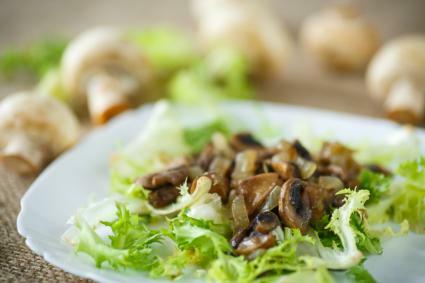 Though mushrooms can be a low-calorie, nutritious addition to your diet, there are no magic mushrooms for weight loss. Mushrooms are rich in valuable nutrients, including vitamins and minerals, but low in fat and calories. There are only about 35 calories in a cup of grilled mushrooms. They can be as tasty as meat and, because they are relatively high in protein (4 grams per cup) and fiber (2.7 grams per cup), you may find a mushroom meal to be more filling and eat less overall. Therefore, there is no question that if you replace a meat-based higher calorie meal with a reduced-calorie mushroom meal you are likely to lose weight over time. The problem comes when there is a false claim attached to the diet - that there is something special about it beyond reducing calories. Unless there are other calorie modifications made to the diet, the calorie calculation of the Mushroom Diet does not add up to the promised four to ten pound weight loss in 14 days. If, for example, you replace a 3 ounce cooked, lean top sirloin steak in your dinner with one cup of grilled mushrooms, you substitute 156 calories for 35, a savings of 121 calories a day, if nothing else changes. That adds up to eating 1,694 fewer calories in two weeks, which translates to less than a pound of weight lost in two weeks (one pound of weight is 3,500 calories). The scientific evidence does not support the promise either. According to a study of 36 participants reported in the journal Appetite in 2013, 36 participants who had a meat-based meal replaced with a mushroom-based meal lost an average of only seven pounds in one year. According to a study in the American Journal of Clinical Nutrition (AJCN), visceral fat (around the bowels) may be mobilized before subcutaneous fat (under the skin). Another study reported in the journal Obesity found that obese women on a low-calorie diet lost proportionally more weight in their mid-upper arms and mid-thighs (peripheral fat) than around their bellies (central fat). However, there are no studies showing selective differences in subcutaneous fat loss between hips, abdomen and breasts based on a specific food, as suggested by the Mushroom Diet. When fat breaks down in response to a lower calorie diet or exercise it is not possible to predict in any given person which subcutaneous fat deposits will break down first based on the diet. How you mobilize fat and where you lose it is based on a combination of your genetics, age, gender, activity level and your pre-diet fat distribution, not on the specific foods you eat. Mushrooms don't magically know where your fat is and how to target certain areas. If you eat fewer calories you will lose fat and lose it all over, no matter what food-substitution you use to reduce those calories. There is no magic diet or magic weight-loss food. Diets like the Mushroom Diet that emphasize a single food, or a single macronutrient, or promote false weight loss expectations do a disservice. When they don't live up to their promises they can lead to frustration and discourage some people from trying legitimate, realistic, healthy weight loss strategies that can be successful. The magic of mushrooms is that they can be a great nutrient-rich, lower-calorie food substitution in your healthy weight management. Include them in your diet plan as a healthy food choice, not for the promise of miraculous weight loss. Talk to your doctor about a sensible diet that works for you - one that you can stick with until you reach your weight goal.